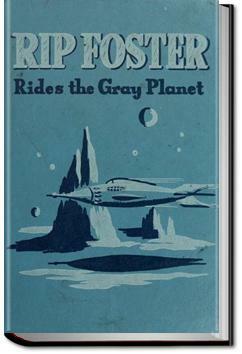 "Foster, Lieutenant, R. I. P.," blared the voice horn, and five minutes later Rip Foster was off into space on an assignment more exciting than any he had ever imagined. He could hardly believe his ears. Could a green young Planeteer, just through his training, possibly carry out orders like these? Sunny space, what a trick it would be! From the moment Rip boards the space ship Scorpius there is a thrill a minute. He and his nine daring Planeteers must cope with the merciless hazing of the spacemen commanding the ship, and they must outwit the desperate Connies, who threaten to plunge all of space into war. There are a thousand dangers to be faced in high vacuum—and all of this while carrying out an assignment that will take every reader's breath away. . . .minor planets were big enough to have an atmosphere or much gravity. If only he could get a look into those cases! But the ship was still decelerating and he would have to wait. He put his head against the chair rest and settled down to wait as patiently as he could. Brennschluss was a long time coming. When the deceleration finally stopped, Rip didn't wait for gravity. He hauled himself out of the chair and the squadroom and went down the corridor hand over hand. He headed straight for where the supplies were stacked, his Planeteers close behind him. Commander O'Brine arrived at the same time. "We're starting to scan for the asteroid," he greeted Rip. "May be some time before we find it." "Where are we, sir?" Rip asked. Granted, I read this when I was teeny-tiny, and it was one of my first sci-fi's; so probably an extra star for nostalgia and not remembering it really well. But I definitely thoroughly enjoyed it back then. An enjoyable 1950 SF novel with cold war overtones. The science referenced is pretty accurate for the time, though the long range communicator with not time lag at planetary distances was not explained at all.